Gov. 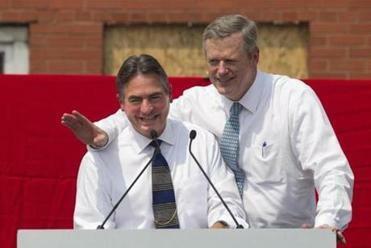 Charlie Baker and Springfield Mayor Domenic Sarno share a laugh in 2015 at the groundbreaking for the CRRC-MA rail car factory. Massachusetts Republican Gov. Charlie Baker has been endorsed for reelection by Springfield Mayor Domenic Sarno, a Democrat. Sarno is one of 22 mayors – ten of them Democrats -- whose endorsements were announced by the Baker reelection campaign. "I am a Democatic, but I'm a moderate Democrat, a centrist and Gov. Baker carries those same attributes on the Republican side," Sarno said in an interview. Jesse Lederman, chairman of the Springfield Democratic City Committee, downplayed the Sarno endorsement of Baker.
" We are closing ranks as Democrats," said Lederman. "We are working together and ready to campaign for Jay Gonzalez and Quentin Palfrey ( the nominee for Lt.Gov) at the top of the ticket and I think the city of Springfield will be served well by them." The Massachusetts Democratic Party announced the launch of a unified campaign to get out the vote in November for each of the party’s nominees on the ballot.